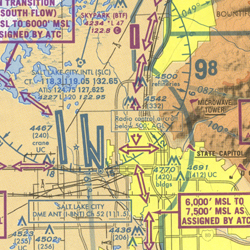 Terminal Aeronautical Charts depict the airspace designated as Class B airspace. The information found on these charts, while similar to that found on Sectional Charts, is shown in much more detail because of the larger scale. These charts should be used by pilots intending to operate from airfields within or near Class B airspace or Class C airspace. Coverage of Terminal Area Charts are indicated by shaded boxes on the Sectional Chart index.